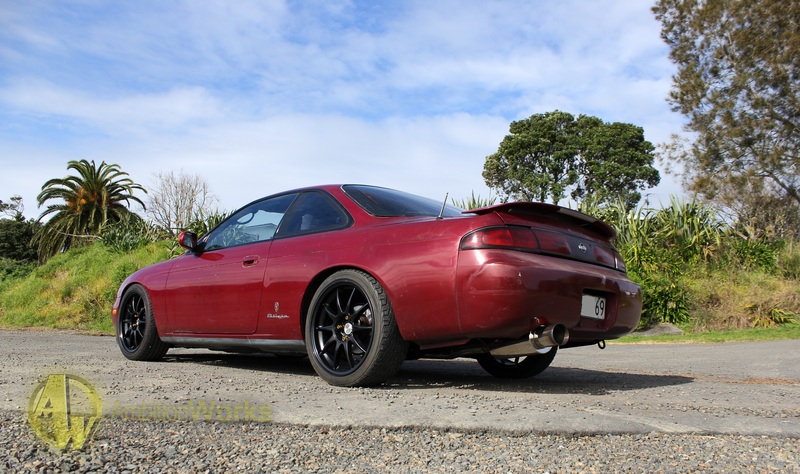 At the start of February I received a call from Carrie who wanted to sell her bone stock Nissan silvia, now it wasn’t exactly what I was looking for at the time but the deal was just too good to refuse, so I compromised and purchase the silvia. 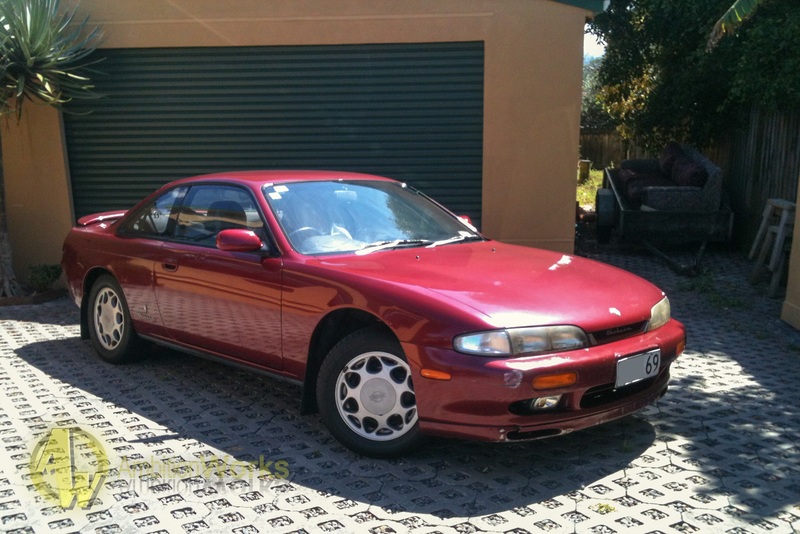 This particular model is a 1994 Q series silvia, close enough if not exactly the same as the base model. It came with fog lights, the hard to find jdm front lip and mud flaps? 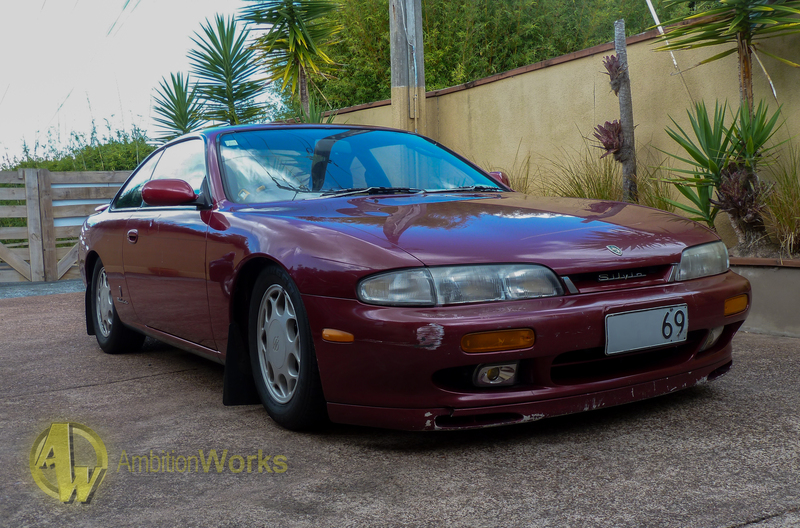 It boasted the sr20de engine which produces 117kw from factory, the small r180 differential and sub frame as well as automatic transmission, a lot of things to work on BUT over the last 20 years it has only managed to clock up a measly 120,000kms. 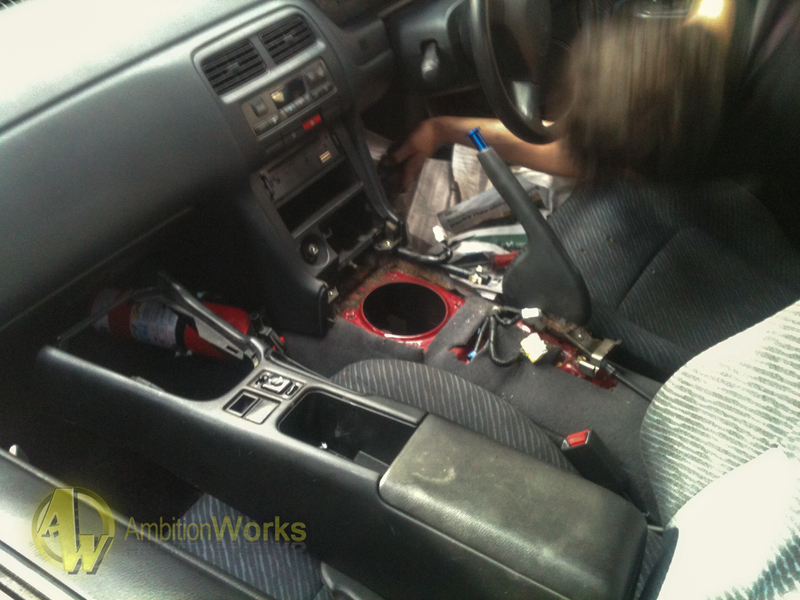 Here is the reason why this was such a bargain of a car, somebody reversed into it with a tow bar creating $1,300 worth of damage according to the panel beater… So instead of fixing it Carrie just dropped this amount off the price. 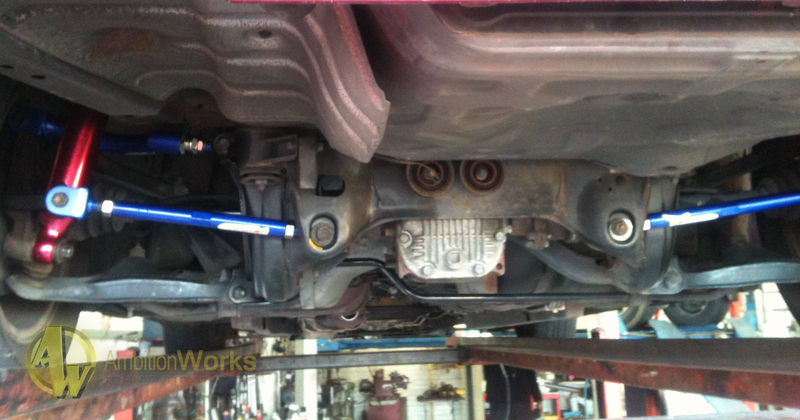 This incident has also pushed the boot out of alignment so a constant rattle occurs when driving. On the back of the car we can see a factory optioned spoiler and aftermarket kenwood speakers. See that kenwood logo? Well at night it works in conjunction with the park lights, it LIGHTS up green! 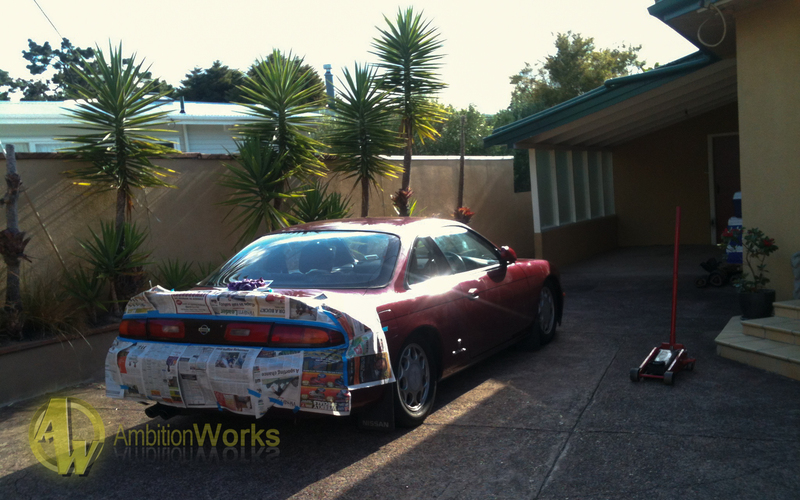 Now that we have gone through the stock car, images started pouring through my mind of what I wanted to change, I had a limited budget, knowledge, contacts and tools. Little did I know that after this build my pockets would be as empty as they could ever possible be. There wasn’t a clear path of direction for this build and I had no estimated time of finishing it either. 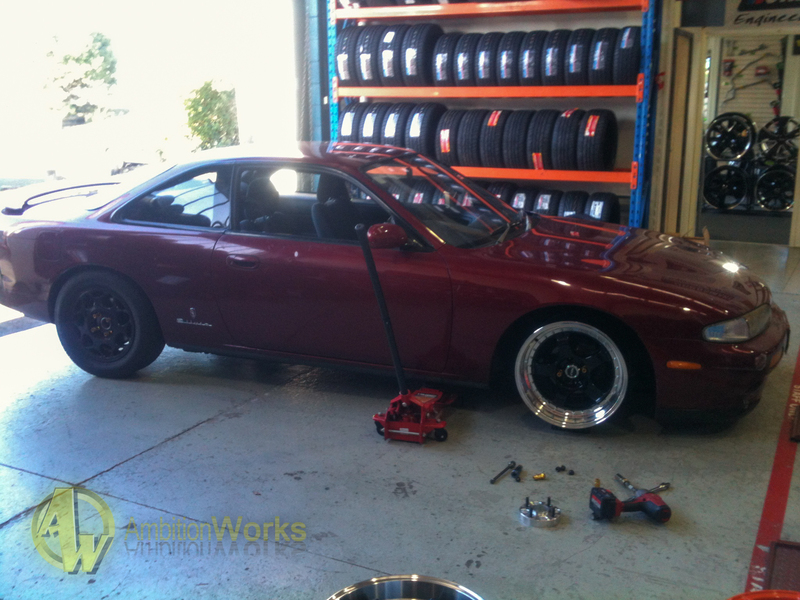 However I was pushed towards the drift side of modifications by my fellow car enthusiasts. Before anything was to take place, me and some friends took to the rear bumper with a heat gun and a foot, $1,300 worth of damage… I don’t think so. The first modification on the list was adjustable suspension, as this can be a costly investment I didn’t look at anything over the 1.5k mark. 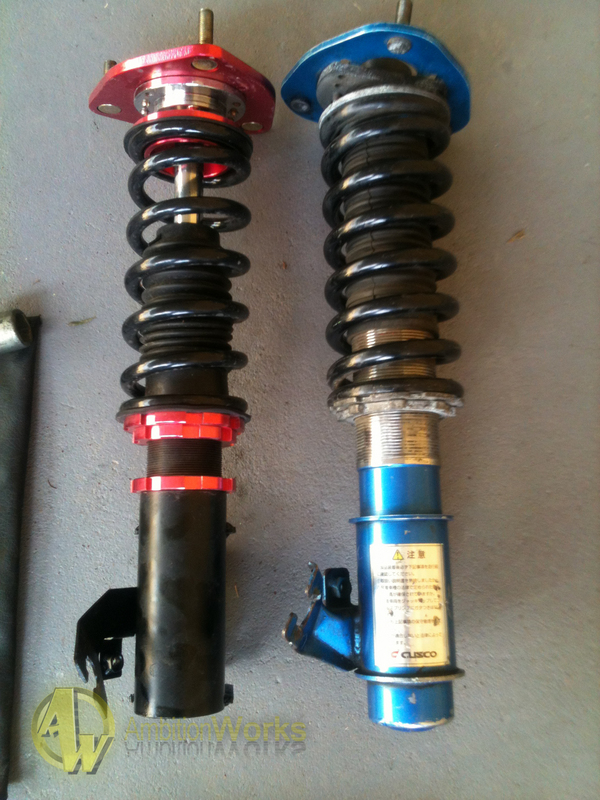 It was either Chinese coilovers off trade me or something along the lines of d2s. 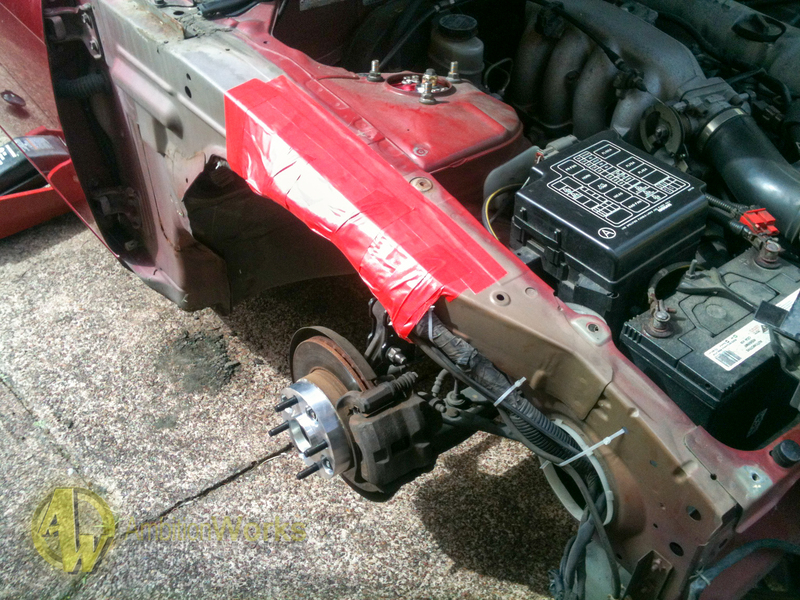 As I still had many plans for the car (a manual conversion as well) the cheaper option of Chinese coilovers was chosen which I would later on regret. The Chinese coilovers took the best part of a day to install as I had never done anything of this measure before, researching online helped but it was still a difficult task for the first time. Slammed, I thought this was cool, form over function and all, later to learn that without further modifications function was a lot better than form. The front wheels were so low they ate through the wires under the wheel arches and the rim constantly knocked the coilover due to the lack of space between the two. Although I thought this looked cool, I couldn’t stand the noise that came with the ‘stance’ or in this case just lowness. To fix these two problems I went out and purchased four spacers, 25mm. These created much more space between everything and filled up the wheel arch. Tackling the wiring issue was not as easy as just purchasing a product. I researched online on how to fix this problem as it is common with silvias, it was here where I could either pay someone to fix this or try myself. As you can see I went with the latter option and fixed the issue myself by duct taping the wires up higher, it may not look permanent but this method has held in place for over 10 months. Back when I had my first car, I really liked the tinted black rear lights everyone had on their cars, but obviously it gained to much attention from the police. So in my case I followed the same modification in a different way, I masked it all up and painted it with transparent red night shade. As most of the rear bar is already red, as well as the car it adds a unique touch to the otherwise stock rear end. As I mentioned before I am on a budget, I left my job last year and have been studying so everything I had was going in to this car (which wasn’t much). A quick and easy job while I search for the perfect set of wheels in my price range was to paint the stock ones currently on the car matt black. 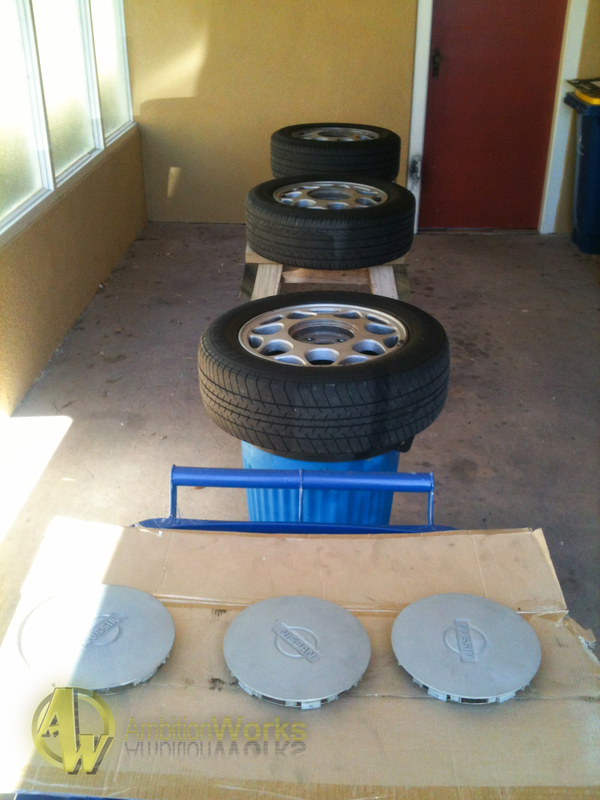 Spray cans from the local automotive shop, not the best equipment in the world but it would have to do. This image sums up what I wanted the car to look like, apart from the wheels, although painting them changed the car dramatically. 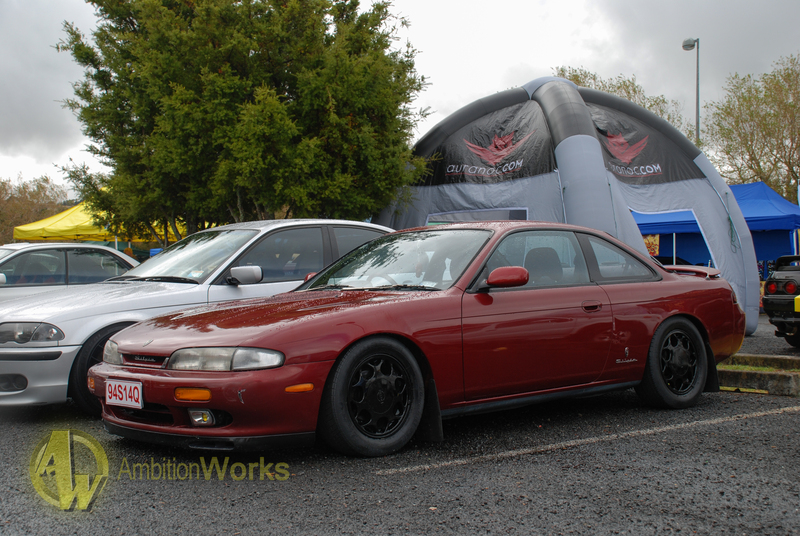 This was the first time I showed the car to the public, at the 2013 Automania, as it wasn’t a very big build, or even a build at all nobody really took a second look at it. This didn’t matter though, because it was me who built the car, all that mattered was that I liked it, which funnily enough for better or worse I did. I did mention that this was run by an automatic transmission, this was the first thing I wanted to change however finding the parts was another story. Eventually I purchase the parts from someone in Christchurch and it was sent up over a few weeks time. 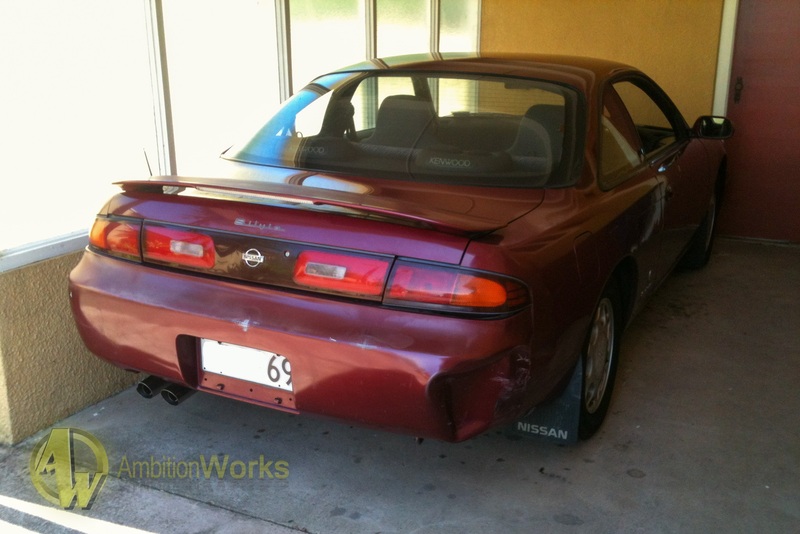 It was now around June and the manual conversion was finally going in, not by me though, it was too much work without the appropriate tools or a lift so I dropped it off at Joe Kyle’s automotive shop (he is great with all things Nissan) and it was changed to a manual silvia in the same day. 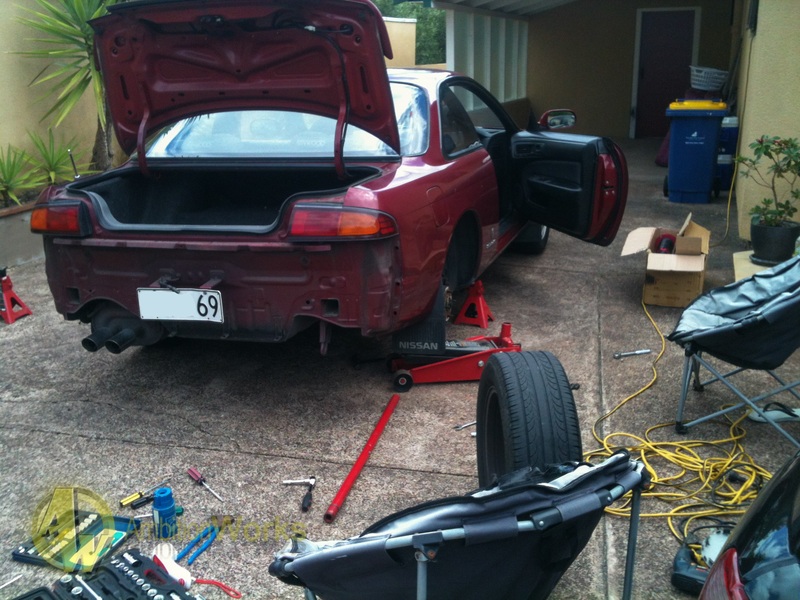 It now ran a 5 speed turbo silvia gearbox with a heavy duty nismo clutch and pressure plate. The wheels was something that I needed to change, as a result I took a journey to visit Nick at platinum wheels and test fitted a few. My favorite by far were these wolf sp1s, 18×9 but sadly way out of my price range so it was back to the drawing board for the wheel department for the time being. Every so often I attend drift days, and more so now that I have the silvia. Towards the end of one of the JDK racing days I jumped on the track for my first time ever to see what it could do. This was the most sideways I achieved and I think it was a mistake from my bad driving. The diff was really open, this didn’t help at all so it was put on the list of thing to change. 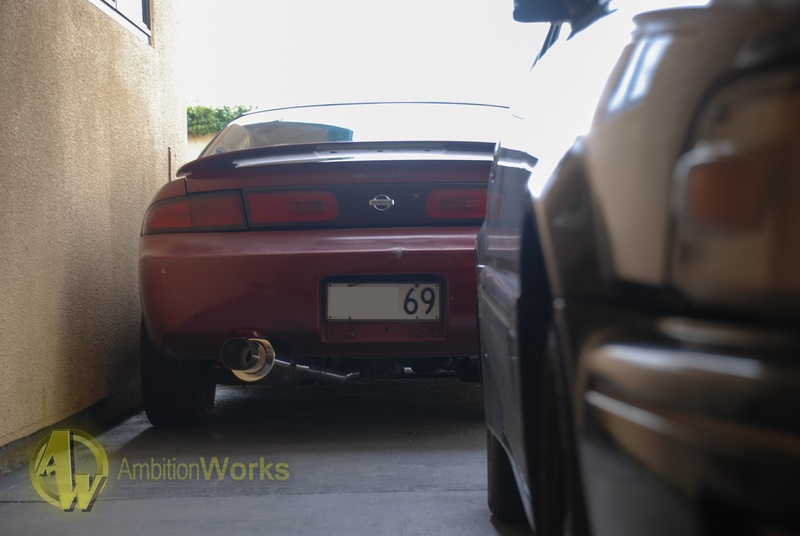 I felt like the full stock engine needed something to give it just a little bit of a push, thus I headed down to pit stop and got a custom catback exhaust set-up installed. 2 ½ inch piping with a 3” muffler. It sounds really aggressive when it’s not farting like a wild potato. The end result looks great in my opinion, it gives the rear end of the car that extra little something to set it off. So I knew that I didn’t have any power in this car, I had to do something else to get it to slide. Stiffening the suspension was the only other option I could and knew how to do, so I purchase hardrace camber and toe arms for the rear. Most people know that this is only a 1-2 hour job, yet it still took me a whole day with lots of cursing to put them in. Honestly with the more modifications I do, I’m starting to realise it’s all about the tools you have that makes the jobs easy. I found these beauties. 18×8 team dynamics with a fresh coat of matt black, without any spacers they fit the car nearly perfectly (with a bit of guard rolling at the front). The set of four set me back only a few hundred with enough tread on the tires to get me past the next warrant of fitness, so I wasn’t complaining. Went back to Neil later that week to retry for the cert, which it passed with flying colours. Not a very full certification plate but none the less it still has enough on it to make me happy. The big lesson I have learned so far from this car is buy it ONCE, go for the more expensive good quality produces instead of taking the easy road and buying cheap products to save a few bucks, because in the end it will cost you more. Back to the happy times of having a well on the way to being complete project car. 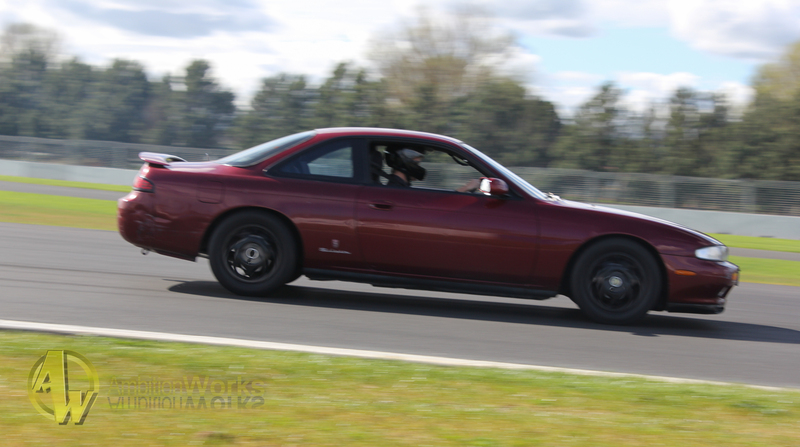 I went out to a track day at Pukekohe to test out if all the work I had done was acceptable on the track. 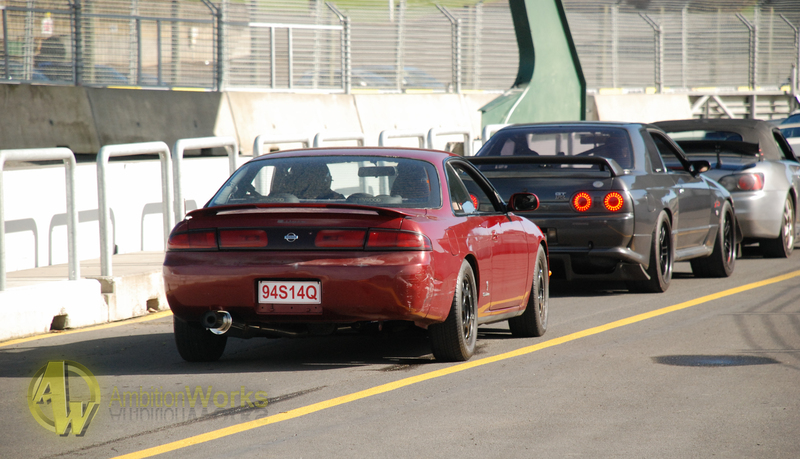 Apart from driving a Lamborghini around Hampton downs this was my first real track day. The nerves where high, but I didn’t crash and the car didn’t break so it was fun times all around. Spending the day out on the track did bring up the issue of the diff though, being fully open was not a good thing as it just skidded out of corners when it was pushed to the limit. This is it, the engine bay. 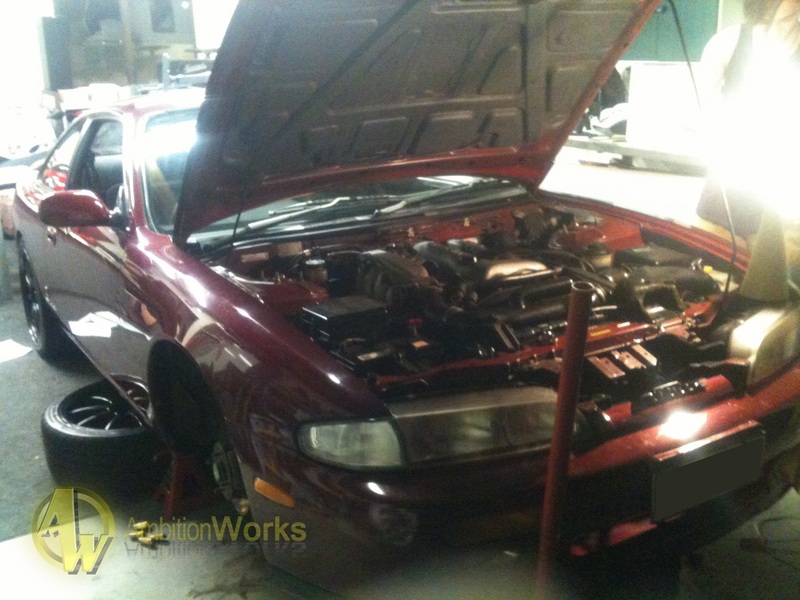 When I purchase it there was a big red pod filter replacing the factory air intake. I soon tracked down a stock one and fitted it back up to have an entirely stock engine bay. It is in great condition with only 120ks on the clock, the only worry about it is that the temperature gauge sits above normal, it doesn’t jump it just sits there. At the moment I’m not too worried about this, but if it because an issue the cooling system will have to be modified. With this engine, the 117kw of fury I was not able to keep up with any of the other cars out on the track, at ALL. The little Honda civics and Toyota starlets all passed me like a blur, I had no chance. But that wasn’t why I was here, I wasn’t here to win or lose in my case. I was here to enjoy what I had produced, to drive a car how it was made to be driven and to gain experience while meeting new people along the way. A few weeks after the track day not much had been done. Myself and a few friends spent a day servicing it for the first time in my ownership, new oil, fluids etc. There is still plenty to do to this car in the future, the diff needs to be welded up and the front camber and lock needs to be adjusted to get the most out of the car when I take it to its first ever drift day at the end of this month. This is the progress to date of my build and I doubt it will ever really be finished. If you are heading to the solid slide session on the 30th of November come and say hi and give me advice on how to drift properly because I know I will be out there on the pan making a fool out of myself.